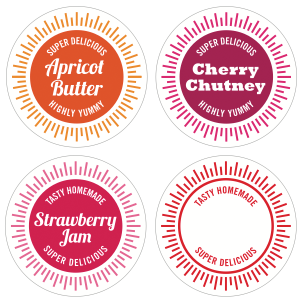 The jar labels I made for apricot butter are yours for the downloading, along with extra labels for strawberry jam, cherry chutney, and a blank label on which you can write your own recipe name. These are 2" in diameter, sized to fit on the tops of 8 oz. jelly jars. You could print them out at 100% on sticky label paper at home or have just a couple sheets printed at a copy shop like FedEx Kinkos. I used them as hang tags on this project, printing them at 85% on cardstock and punching a tiny hole at the top. For recipe ideas, visit Sweet Preservation or Saving the Season. Ooooh, thanks!! I can use the blank one for my freezer blackberry jam. Yum! Viiriäinen, I've updated the post to include a few recipe sites. You are awesome!! Thank you! I am making strawberry jam this weekend so this is perfect timing! Thank you so much for these! I've been on a jamming storm lately and these will be absolutely perfect!!! Oops! 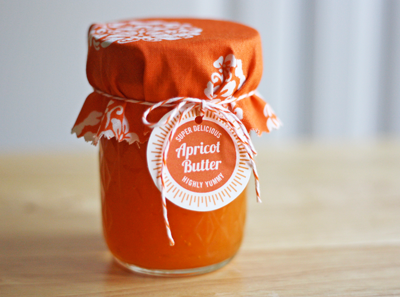 Would you be willing to share your recipe for Apricot Butter? SO CUTE! Thanks! I'll be making fig jam later this summer once my tree blooms, so the blank one will come in handy. You've inspired me to try my hand at making jam. Yours look lovely. Thanks for the labels! can't wait to use them:). I love these colors! I'll be making jam for the first time next month. I can't wait! Thanks so much for these, I'll be linking. Love your blog. So inspiring! I would love to know where you got the fabric for the covers and how I could order some. It matches my invitations perfectly! Any clues would be very much appreciated. Hi Diana, it's Bloom Orange Woodland Delight, designed by Paula Prass for Michael Miller. You can Google to see if any shops still carry it. Thank you oh so much for responding. Unfortunately I was not able to find it. I'm still grateful you shared the name with me! I know this post is super old, but I just made Strawberry Jam for the first time (It was a success!) and came to your site knowing I'd find some awesome labels for the lids. Thanks for not disappointing me! I also snagged the more recent write-in ones because I couldn't decide whether or not I wanted a space for the year. They're both amazing. We always recommend to take care about presentation of the DIY gifts; these labels are absolutely perfect for a lovely gift in a jar!